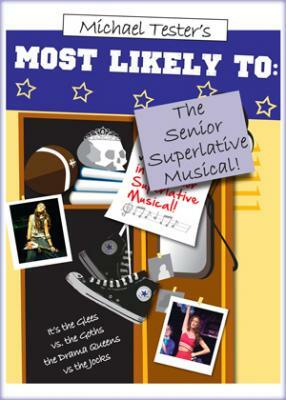 Most Likely To: The Senior Superlative Musical (Paperback) | The Drama Book Shop, Inc. Cast: 7m., 10w., 1 either gender. With over 36 featured roles, the show can be done with as few as 12 actors or as many as 40 or more to cover a show choir, an a cappella glee club, dancing cheerleaders and more! It's the Glees versus the Goths, the Drama Queens versus the Jocks in a Senior Superlative showdown! Most Likely To has captured that lightning in a bottle known as the teenage drama queen. Set at a high-school awards ceremony, Most Likely To explores the trials and aspirations of teenagers through a thematic arc of song, sketch and monologue, allowing ample room for creative staging and flexible casting. The score ranges from pastiche to pop, emo to country western and includes soaring musical theatre anthems, rock, R & B and rap. Unit set. Approximate running time: 1 hour, 40 minutes.